Scores of toll employees of SLEX together and their supporters are holding a protest this afternoon in Laguna. The National Mediation and Conciliation Board regional office in Laguna is convening a hearing today due to workers of complaint of illegal dismissal. 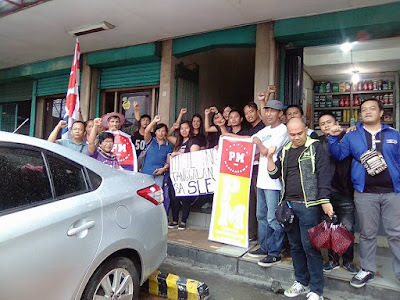 Randy Tuason, a leader of the MATES workers, declared that "We are demanding that workers be absorbed as regular employees in PITC and that the union also be recognized. It is utterly unfair to be demoted as probationary employees in an agency when we have worked as toll employees for years already." In the first mediation hearing last week, no agreement was reached. MATES-SLEX said that they will consider the demand of the workers for absorption as regular employees. Workers also picketed the mediation hearing. “If this is allowed at MATES-SLEX then it will be followed in other toll roads. Instead of toll payment interconnection as announced a few days ago, we will have rampant contractualization in the expressways. We call on the DOLE to intervene in this issue,” he added.